West Hampstead Life | What have I missed since September 19th? What have I missed since September 19th? What were locals murmuring about this week? As usual, everything is documented here. If you’re out of time to check the blog remember you can sign up to an automatic newsletter that reveals everything. I’m reckoning that’s enough R.E.M. references for now, though there might be a few more buried below. There was an armed robbery in Kilburn on Friday. The Tricycle is going to dramatise the summer riots. There’s a monster cat seemingly on the loose in West Hampstead. Is Ed Fordham set for the pageantry of the Lords? Hellenic, the restaurant on the corner of Finchley Road/Rosemont has closed – it’s set to become a café apparently. West End Lane’s Spice 212 has also closed. Property was big news this week. The new Mill Lane residential development claims to be in a green nature reserve. West End Estates has launched on a new adventure as Edmund Cude. West Hampstead featured on Location Location Location, and on the BBC’s To Buy or Build later in the week. There was a great write-up of last Saturday’s honky tonk night at The Alliance. Also at The Alliance, art students from College of NW London are exhibiting at the moment. 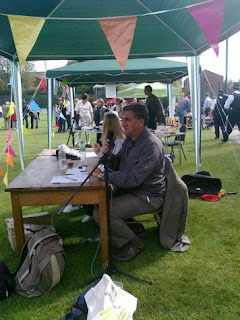 There’s a write-up of the Hampstead celeb charity cricket match on the blog. Tom’s Diner visited Gourmet Burger Kitchen. The Alice House had its first comedy night, and The Gallery celebrated its 15th birthday. Finally, the new lights on the Black Path seem to be a hit.